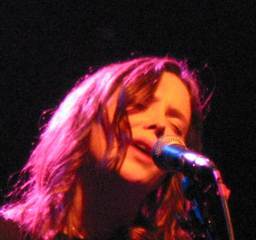 Last night, I went to the ICA to see a performance by Rachel Goswell, who was doing a support set for the Cranes. She did pretty much the acoustic guitar-folk singer-songwriter thing, accompanied by a bloke with a guitar. Rachel started off singing as her accompanist played guitar, and later ended up picking up a guitar (and, towards the end, a small squeezebox). A few songs into the set, one fan called out requesting Catch The Breeze, which Rachel politely declined, saying that it was 12 years too late for that. 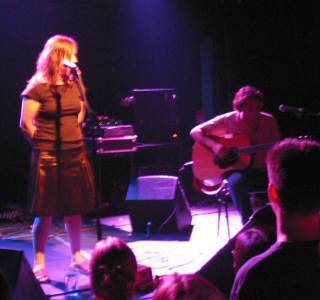 Anyway, it was pleasant enough (Rachel, as Slowdive fans will know, has a lovely voice, and the guitar parts were quite good too), though I couldn't help but think that it would have benefitted from a few more layers; perhaps some strings or even some low-key electronics. I caught a few songs by the Cranes (by when the albedo of the crowd had darkened considerably); they were basically a goth take on early-90s shoegazer, much as I remembered. And the vocalist sounds as if her voice was being played back at slightly too high a speed.